God calls His Own Son the Word, His Word to us. What is a word? A word is a means of communication. A word is something that you say. It means something. What is the Word of God?--Jesus! God wanted to show the World His Love.--So what did He do? You can't see Love, you can't see God, so He sent His Word! He said it in Jesus! He showed it in Jesus! He expressed it in Jesus! He communicated it in Jesus! Jesus was all of that! He was the expression of God's Love, He was the meaning of God's Love, He was the communication of God's Love, He said God's Love, He showed God's Love, He symbolised God's Love, He manifested God's Love! He was God's Own Message of Love to us! The first thing St. John says in His Gospel is: "In the beginning was the Word, and the Word was with God, and the Word was God. The same was in the beginning with God. All things were made by Him; and without Him was not anything made that was made." 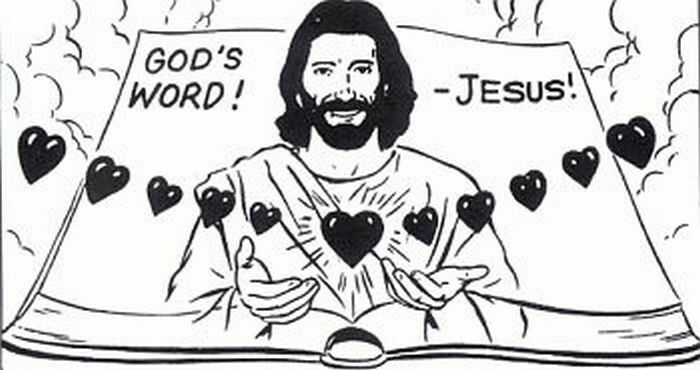 (Jn.1:1-3) It seems that only John really grasped the deepest and greatest meaning of Jesus, that Jesus was the Word of God, the Expression of God, the Love of God, as well as the Son of God!